Don't pay attention to the tiles, I always put them everywhere, for space evaluation purposes. I commented on this in chat but forgot to actually post on the topic (bad fish). What I like: Very very cool use of fence stacking on the front (or its a really nice custom fence), super cute switch back stairs, good window choices. 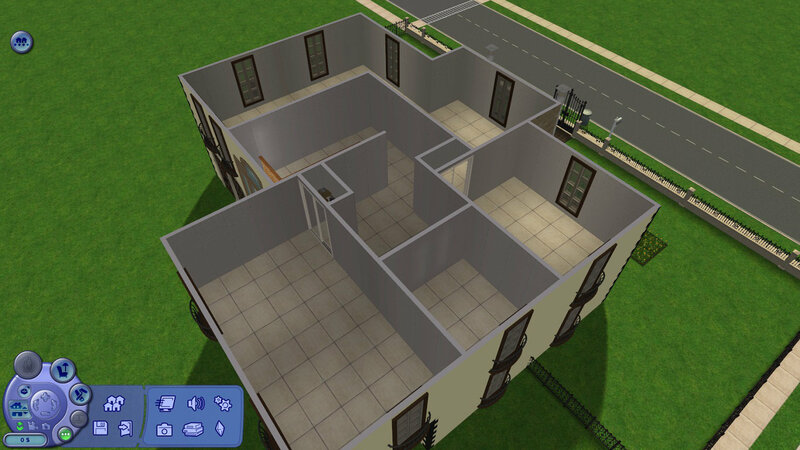 What I might change: Some inefficient use of space on the ground floor - the two rooms with no access, I would look at how those rooms are accessed, the columns on the front - I would take the roof BACK one tile and use move objects to shift those columns closer to the wall so they look like they are supporting the natural roof overhang. Overall? Looks like a great remake so far. I agree with Lee Cool house! Oh, have just noticed that I'm a 'amster fish on LeeFish.nl! Thank you Lee, it suits. ^_^ Btw, I've registered again on TSR under this new username (about one week ago). Here are eight pictures of the continuation of my work. I've not done every room, because I firstly wanted to get your advice about my quite baroque style on this one (done on purpose of course, but don't know if it's appropriate enough). 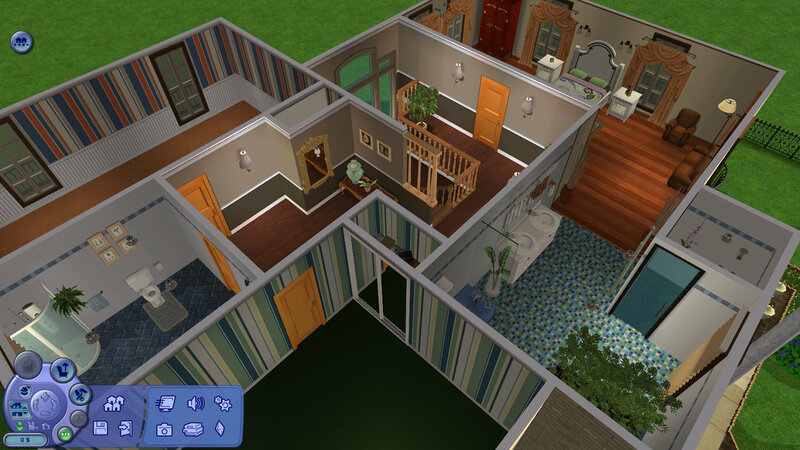 Indeed, the three bathrooms (there's a fourth undone one) are of contemporary modern style; while the foyer, the spare space (1st floor) and the master bedroom are made in a mix of different oldish styles. Otherwise, I've a little bit lowered the roof and placed the columns a bit more right for everything to look nicer, according to Lee. The garden area is made only on the front part of the lot, but I haven't painted the terrain yet. As always, every kind of comment is welcome (good, bad... very bad). I like this house and I love the landscaping that you have done so far. There are a few things that I think would improve it though. Brick pillars at the back of the house: this style/colour of pillar just doesn't look right, they might look better in white? Decorating: I like the majority of what you have done but there are just a few bits that don't seem to sit right together. I'm not sure the gold curtains and the bedspread in the master bedroom look right together - the curtains are traditional whilst the bedspread is very modern. I love the bathroom with the planting and layout but the bath is very old-fashioned in blue. I always use white bathroom fittings myself. Large double-storey window: I like what you are trying to achieve with this window but it doesn't go with the others in colour or style. (15-04-2014 07:32 PM)Karen Lorraine Wrote: Brick pillars at the back of the house: this style/colour of pillar just doesn't look right, they might look better in white? Ok, I think I must try with white walls there. I used this brick wall because it's the same as the one at the front of the house and thought it would be nice not to have too much wall styles/colors. 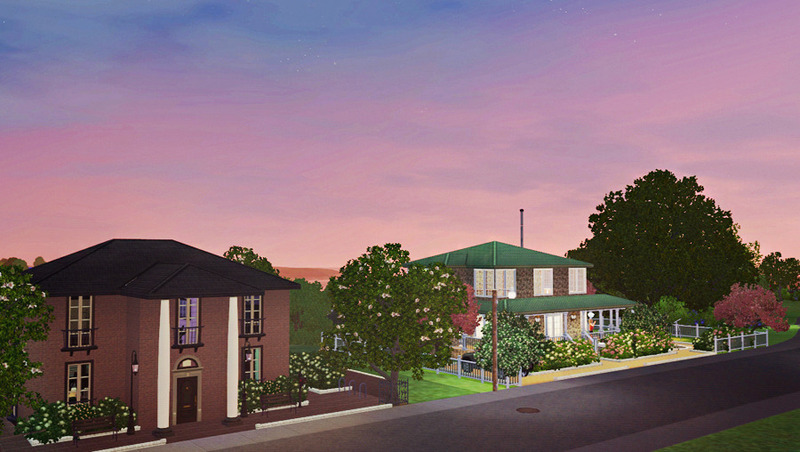 Btw, there are two tones at the front of the house (I used Kiri's tip, the one she gave me for my previous lot). (15-04-2014 07:32 PM)Karen Lorraine Wrote: I'm not sure the gold curtains and the bedspread in the master bedroom look right together - the curtains are traditional whilst the bedspread is very modern. Ok, will change the bedspread for sure. You're totally right. (15-04-2014 07:32 PM)Karen Lorraine Wrote: the bath is very old-fashioned in blue. I always use white bathroom fittings myself. White it will be then. I agree. (15-04-2014 07:32 PM)Karen Lorraine Wrote: Large double-storey window: I like what you are trying to achieve with this window but it doesn't go with the others in colour or style. Thanks Karen, and thanks Klaartje. It's super to get your ideas.